Apparently frustrated over not achieving the ultimate objective of their sit-in protests against the Pakistan Muslim League-Nawaz (PML-N) government, ‘political cousins’ Tahirul Qadri and Imran Khan Saturday trained their guns on the Pakistan People’s Party (PPP) leadership, particularly its co-chairman Asif Zardari for criticising their protests and putting the PPP’s weight behind the Nawaz Sharif government. Taking the rostrum at the Inqilab sit-in venue on Constitution Avenue, firebrand cleric and chairman of the Pakistan Awami Tehreek (PAT) Tahirul Qadri lashed out at Zardari, warning him “to keep his tongue under control otherwise he would take it out from his mouth”. Alleging that Zardari’s politics was a result of the National Reconciliation Ordinance (NRO), Qadri said the PPP leader’s corruption was not hidden from anyone and “I know everything about his wealth stashed in Swiss banks”. 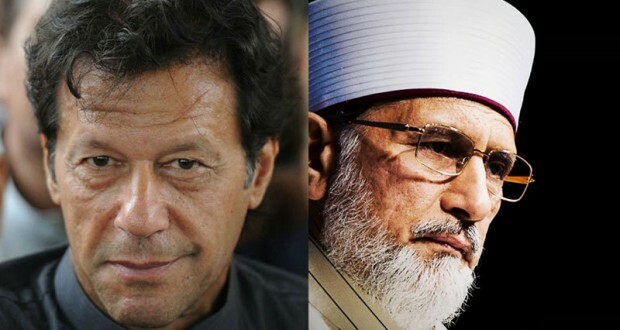 Qadri said that Nawaz Sharif and Zardari were on the same page against the ongoing sit-ins. “The nation has been slaughtered with the knife of starvation and ignorance but PAT’s protest has woken up the nation from slumber,” he claimed. Meanwhile, Pakistan Tehreek-e-Insaf (PTI) chief Imran Khan told his supporters at Islamabad’s D-Chowk that PPP was a hereditary political party which had concentrated all powers in one family. “First the wife (Benazir Bhutto) handed over the PPP’s reins to her husband (Asif Zardari) and now he has passed on the sceptre to his son Bilawal Bhutto. How can the PPP call itself a democratic party when it itself does not exercise democracy in its ranks,” he said. The PTI chief, who has been promising his supporters fresh elections in every speech he has made since the beginning of the sit-in protest, said that elections would be held “before the next Eidul Azha”. “I assure rule of merit in Pakistan when PTI comes into power. We will bring down prices of electricity and ensure that people’s living standards improve across the board,” he said. Reacting to Qadri’s outburst against his father, PPP Chairman Bilawal Bhutto, in a tweet, declared the PAT chief “a cartoon who says one thing one day and a completely opposite thing the next day”. “Please ignore such hypocrites,” Bilawal tweeted. Sindh Information Minister Sharjeel Memon said that Tahirul Qadri and Imran Khan couldn’t bring their much touted revolution so now they are stooping low by using derogatory words against leaders of major political parties. QUADRI MULLA KAAFIR FOULMOUTHER SC8M MUST FACE COURTS FOR INCITMENT OF VIOLENCES ..IMRANKHAN KANJAR DALAAH BOTH FIRANGIHULAMS GADAARS ..MAY KHUDA GIVE QUADRI IMRAN HORRIBLE DEATHS IN JAHANAM .. I have replied to you by the name of anonymous. Your are a 3rd rated person yourself. And using such a language for Dr. Tahir-ul-Qadri. Once again shame on you. Shame on you 'outspoken' just look at the vocabulary you have used. You think you will not get fire on your tongue by using such language. Choice between the cousins and the others, is between the devil and the deep sea. Not much to discuss. UR DEAF BLIND TO BITTER TRUTH ABOUT QUADRI- FAKE MULLA – DISGRACE TO ISLAM BASED ON SACH-TRUTH AND HAQ-BASIC HUMAN RIGHTS FOR ALL .. QUADRI IS POLITICAL DALAAH .. Since you are so outspoken, why don't you ask the Chor Dakoo Zardari and Nawaz to show a good will gesture to the people of Pakistan by bringing back the money they stole from the people of Pakistan, unless you are the one holding the stolen money in your account? By the way your choice of language is not appropriate for online comments. THIS LANGUAGE IS BETTER THAN WHAT KANJARS IMRAN N QUADRI USE ON LIVE TV -CHANNEL FUNDED BY FIRANGIS -STAFFED BY KANJARS anchors..